Our commitment to you is that we will do everything we can to make our products safe for you and your family. Just as we take precautions to ensure our products are safe, we encourage you to take precautions while preparing, cooking and storing food – your family’s best defence against foodborne illness. 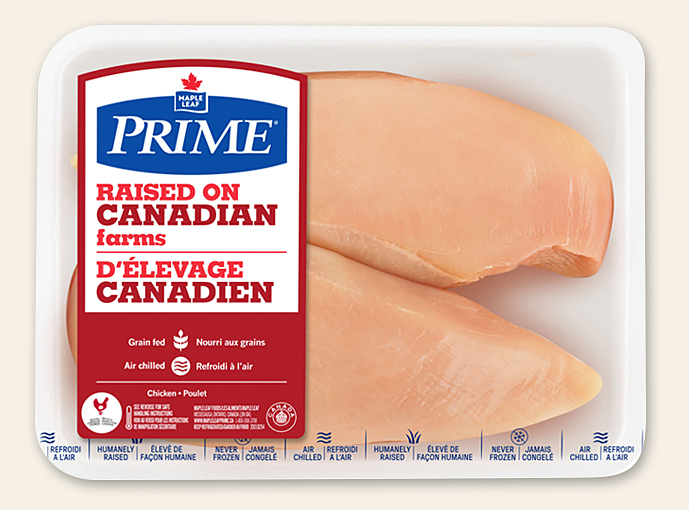 At Maple Leaf Foods, we do our very best to minimize the presence of bacteria that can cause foodborne illness, such as Salmonella, Listeria and E. Coli. However, as with all fresh and uncooked breaded meats, it is not possible to eliminate bacteria totally. 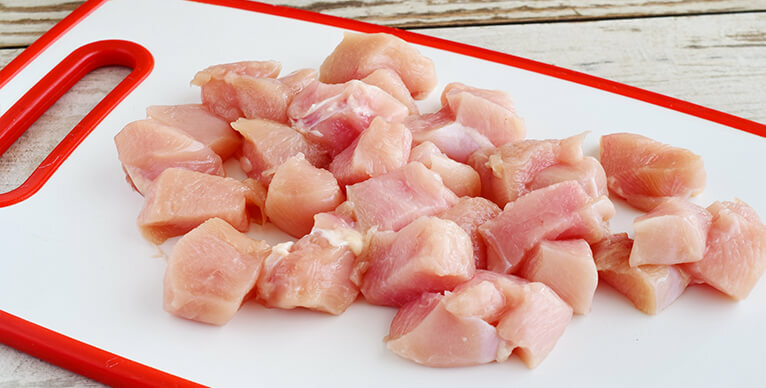 You should take precautions when handling any raw and uncooked breaded meat, especially chicken, by cooking it properly and handling all food carefully to avoid cross-contamination. What are Salmonella, E. coli and Listeria and how to prevent getting ill. This is our Safety Promise. Our goal is to always provide consumers safe, great tasting food produced in a safe work environment. We commit to becoming a global leader in food safety and job safety, and providing the focus and resources needed to achieve this goal. We commit to establishing a culture of food safety and workplace safety with high-performance teams, where people are encouraged and expected to act on any concerns they may have. We commit to measuring our safety performance, with testing and benchmarking against globally recognized standards. We commit to continuously seeking better ways to make safe food, and to make it safely. We commit to openly sharing our knowledge with government, industry and consumers, so we can learn from them and they can learn from us. We commit to transparency and candour in pursuit of better performance and public confidence. We commit to behaving in the most responsible and transparent way possible, placing the safety of our people and our consumers first if there is ever a breach. There are an estimated 4 million cases of foodborne illness in Canada every year. Food contaminated by bacteria, viruses and parasites can make you sick. Many people may have had foodborne illness, sometimes called food poisoning, and not even known it. Salmonella bacteria are found naturally in the intestines of animals, especially poultry and swine. Salmonella bacteria can also be found in the environment. 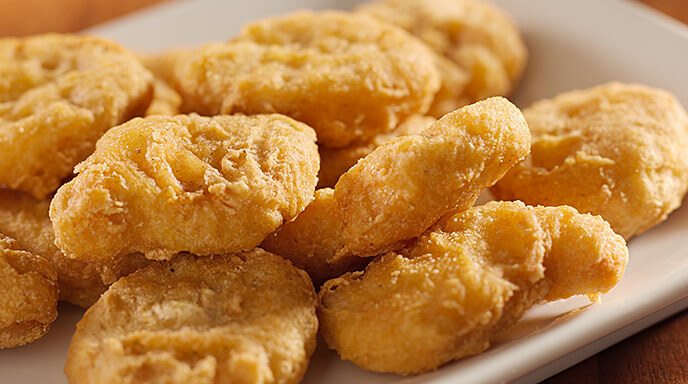 When people consume food that is contaminated with Salmonella, they can become ill with salmonellosis – often referred to as Salmonella poisoning. Salmonella is usually contracted from foods such as undercooked chicken, eggs and pork, but can also be consumed from unpasteurized dairy products and raw fruits and vegetables. Food can become contaminated with Salmonella during the slaughter and processing of an animal, when food is handled by a person infected with Salmonella, or from cross-contamination due to un-safe food handling practices. The most common symptoms of salmonellosis are diarrhea, fever, vomiting and abdominal cramps, which usually appear 12–72 hours after eating contaminated food and may last up to seven days. In more serious cases, the infection may spread from the intestines to the bloodstream or one may experience chronic symptoms, such as reactive arthritis, three to four weeks later. Some people infected with the bacteria may not experience symptoms, but can still carry the bacteria and spread the infection to others. The elderly, infants and those with compromised immune systems are most likely to experience severe symptoms and illness. How Can I Lower My Risk of Contracting Salmonella? One can avoid becoming ill with salmonellosis by taking proper precautions in preparing and handling food. E. Coli bacteria are found naturally in the intestines of animals such as cattle and poultry, as well as other animals. E. Coli can be acquired by eating contaminated food. The bacteria live in the intestines of some healthy cattle and contaminate the meat. Eating meat that is not properly cooked is the most common way of getting the infection. Person-to-person transmission can occur if infected people do not wash their hands before and after handling raw foods. If someone becomes infected with E. Coli, they can become seriously ill. Symptoms can appear within hours and up to 10 days after consuming the bacteria. The most common symptoms include severe abdominal pain and bloody diarrhea (hemorrhagic colitis). The majority of people recover within 7–10 days. Some people infected with the bacteria may not experience symptoms, but can still carry the bacteria and spread the infection to others. If you think you are infected with E. Coli, you should not prepare food for other people as people who are infected with E. Coli are very contagious. Everyone is susceptible to E. Coli infection; however, the elderly, infants, pregnant women and those with compromised immune systems are most at risk for developing serious complications. How Can I Lower My Risk of Exposure to E. Coli Bacteria? You can avoid becoming infected with E. Coli by taking proper precautions in preparing and handling food. Do not eat food that isn’t properly cooked. There are six different species of the bacterium Listeria. Only one of these species, Listeria monocytogenes (L. monocytogenes), causes human illness – the others are usually harmless for humans. Listeria can be found almost everywhere and has been isolated from a number of sources, including soil, water and foods. It has the ability to survive in a variety of different environmental conditions, including cold, moist environments, like refrigerators. Within L. monocytogenes, a multitude of different strains (e.g., more than 300 strains identified in one study) have been documented. Strains can be defined by a variety of methods, including a process known as pulsed-field gel electrophoresis (PFGE) which gives different “genetic fingerprint” patterns. Listeria can be found almost everywhere. Listeria can be found in unprocessed food such as raw dairy products, meat, poultry and fish, as well as processed foods such as deli meats, hot dogs, cheese and ice cream. It is sometimes found in raw vegetables. It can also be spread through contact with contaminated surfaces such as hands or kitchen counters during food preparation. This is the serious infection caused by eating food containing L. monocytogenes. Listeriosis usually occurs only in people with weakened immune systems (e.g., AIDS patients, organ transplant recipients, cancer patients), the elderly, pregnant women and newborns. The infection can begin with fever and gastrointestinal symptoms, but can spread to the blood stream and/or the nervous system, giving symptoms of meningitis. In pregnant women, L. monocytogenes can also spread to the fetus, causing premature delivery, miscarriages or infections of the newborn baby. The incubation period can be as much as 70 days after exposure for the more serious forms of listeriosis; however, symptoms usually appear within 2–30 days. For the milder forms, it can be as little as one day. Listeriosis is rare, but contracting it can be very serious. Listeriosis is very rare, affecting an estimated 1–5 people in every 1,000,000 people per year in most developed countries. Contracting the disease can be very serious – an estimated 20 percent to 30 percent of people with this disease die due to listeriosis. Elderly individuals, pregnant women and people with compromised immune systems are most likely to be affected. Elderly individuals are four times more likely to get ill and account for more than half of all cases. Pregnant women are 10–20 times more likely to get listeriosis (as compared to non-pregnant individuals) and account for about a quarter to a third of all listeriosis cases. Persons with cancer, AIDS and other immune suppressant conditions are hundreds of times more likely to get listeriosis, as compared to healthy individuals. Minimize risk with safe food handling and proper refrigeration. 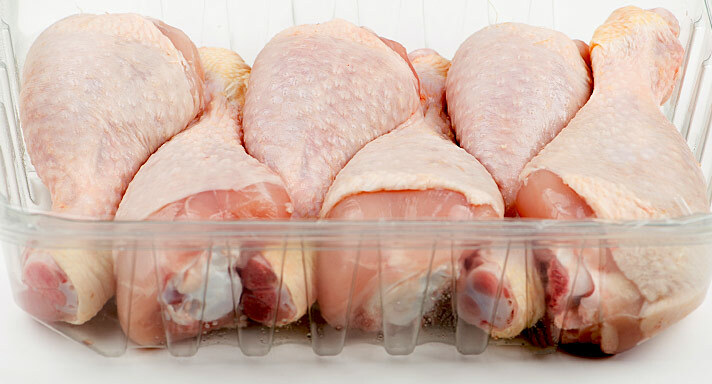 Even if L. monocytogenes is absent in ready-to-eat meat and poultry products after processing, or found at very low prevalence and levels, additional contamination can occur after the packs are opened – especially when the meat is handled. Although L. monocytogenes can grow while refrigerated, growth is very slow at temperatures below 4ºC. In ready-to-eat foods stored at higher temperatures, for example above 7ºC, growth occurs more rapidly, increasing the risk that L. monocytogenes will reach levels more likely to cause human illness. Both safe food handling and maintaining proper refrigeration temperatures are critical to minimizing the risk of listeriosis. Listeria is killed by cooking. Thoroughly cooking product to 165ºF/74ºC will kill the bacteria. Consumers at high risk for contracting listeriosis (e.g., pregnant women and the elderly) should reheat deli meats immediately before consumption. Listeria is not killed by freezing. Growth is arrested altogether, but normal growth will resume after thawing. Listeria is everywhere, so elimination is out of the question. Listeria is expected to enter any meat plant with raw materials and personnel and, once inside, it can live almost anywhere – on floors, drains, cooling, ventilation, slicing and packaging equipment. The strategy for the food industry remains one of risk mitigation driven by robust surveillance and sanitation programs. Regular cleaning and sanitation is needed to prevent growth and survival of this organism, including disassembly and deep cleaning and sanitization of harbourage points of equipment and surfaces in contact with ready-to-eat meats. Control of Listeria in a manufacturing plant is monitored by a program of regular swabbing and sampling from the plant environment. There are standard remedial procedures for immediately re-testing any sites that test positive for Listeria species, including supplementary cleaning protocols. Environmental testing is industry best practice to detect and manage Listeria in a food processing plant. It is more informative than finished product testing, as it points to the source as a target for further sanitation. How to keep you and your family safe at home. Help keep your family safe from foodborne illness while preparing, cooking and storing food. A number of simple precautions can make all the difference. Many people practice unsafe habits in the kitchen and don’t even know it. This regularly leads to food poisoning. In fact, you may not even know that you have a mild form of food poisoning, as you may just think you have the 24-hour flu. These tips can help keep you and your family safe. Bacteria can hide in cracks and grooves in cutting boards. But with the right care and cleaning, your non-porous cutting boards can be safe and useful tools when preparing meals. A good cutting board is smooth, durable and non-porous. Choose a board that you can clean easily and that will resist deep scratching with use. Use multiple cutting boards. Keep one board for raw meats, raw poultry and raw seafood, and another board for foods like fruits, vegetables, cooked meats and cheeses. Use hot water and soap to clean your board. Use a scrub brush to remove bits of food stuck to the board. Sanitize your cutting board with a mild bleach solution (5 ml/1 tsp bleach per 750 ml/3 cups water). Wait until your board is completely dry before storing. Keep cutting boards stored away from raw meat, poultry or seafood until you use it next. Bacteria and micro-organisms love kitchen sponges. Over 7 billion E. Coli, Salmonella and Staphylococcus can live in one kitchen sponge! Instead of sponges, use disposable paper towels and a mild bleach solution (5 ml/1 tsp bleach per 750 ml/3 cups water) or disinfecting wipes to clean kitchen counters. Keep anti-bacterial wipes handy in the kitchen. These are great for cleaning up after handling meat and wiping up any spillage from meat packaging. Refrigerators and freezers can slow and stop bacterial growth. It is important to clean the refrigerator and freezer regularly to remove spoiled foods that can transfer bacteria or moulds to other food. Wash your hands thoroughly, and wash them often! Use warm, soapy water to prepare foods and especially after touching raw meat, poultry and seafood. From cutting vegetables to touching raw meat, each time you switch gears in the kitchen, wash your hands. Make sure to dry your hands. 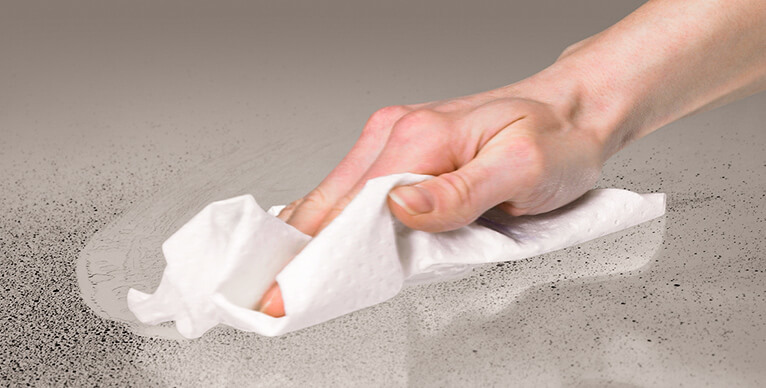 Use disposable paper towels or clean cloth towels to dry your hands. Air drying is also a safe option. Hand washing should last at least 20 seconds. While soaping up, sing two whole choruses of “Happy Birthday” to time yourself. Leftovers should be cooled as quickly as possible. To cool leftovers quickly, refrigerate them in shallow containers. Do not keep longer than three days. Foods that you intend to keep longer than three days should be kept in the freezer. Do not keep foods in the freezer for more than six months. Leftovers should not sit out of the refrigerator for longer than two hours. If weather is hot (over 27ºC), food should be refrigerated within one hour. 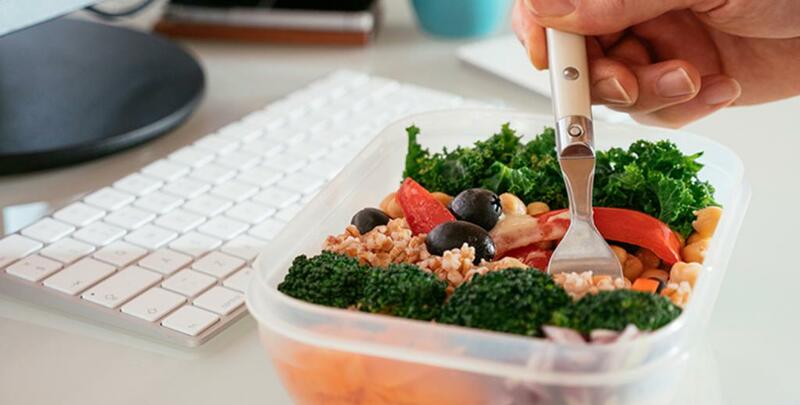 Pack up those leftovers for a delicious, nutritious lunch. Spill-proof, sealable bags are a must for storing food safely. Stock up on these items to keep leftovers ready for the lunch box. 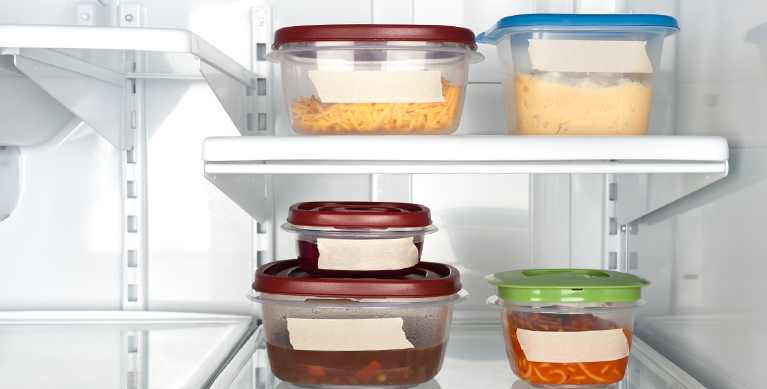 Store your lunch safely in the refrigerator overnight. As when cooking, prepare a clean surface for lunch packing by washing your hands, utensils and counter with hot, soapy water. Make grocery shopping the last errand of your day so you can get food home and refrigerated as soon as possible. Typically, foods requiring refrigeration should not remain unrefrigerated for more than two hours. On very hot days (more than 27°C), this should be reduced to one hour. While shopping, make the meat aisle your last stop to keep meats cold as long as possible. In your cart, keep meat separate from other ready-to-eat foods. Make sure meat is wrapped tightly with no rips or holes in the packaging. This prevents leakage and keeps micro-organisms at bay. If possible, pack meats separately from your other groceries. Store the meat you purchase properly: groceries that require refrigeration should be put in the refrigerator or freezer as soon as possible after they are purchased. Make a habit of regularly washing your reusable cloth bags, especially those used to transport meat and other perishable food items. A meat thermometer is the only definitive way to know that your meat is cooked properly. Many inexpensive, user-friendly models are available to suit your individual cooking needs. A meat thermometer is the only definitive way to know that your meat is cooked properly. Proper use of the meat thermometer is crucial to maximize food safety. The thermometer must be inserted into the thickest part of the meat, without touching any bone or fat to get an accurate reading. A cold spot in food can become a hotbed for bacteria. When using a microwave oven, cover food, stir and rotate for even, thorough cooking. Use a meat thermometer to test the internal temperature of meat and poultry. Moist heat is a good option for tenderizing larger or less tender cuts of meat. 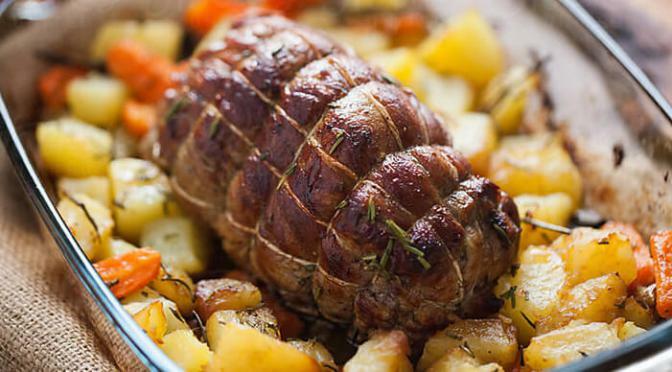 Meat should be covered with added liquid – as a general guideline, approximately 30–35 minutes per pound (0.5 kg) at low heat or in the oven at 325ºF (160ºC) – until the thickest portions of the meat throughout the pan reach 160ºF (71ºC). Dry heat cooking is generally best for naturally tender cuts of meat. Cooking times and temperatures vary depending on cook method and size of portion, but in all cases, doneness is achieved when the thickest part of the largest portion reaches 160ºF (71ºC). Keep meat uncovered with NO added liquid. Chicken is a tasty and popular meal choice. Cooking times vary depending on cook method and size of portion, but in all cases, doneness is achieved when the thickest part of the largest portion reaches the required internal temperature. Public health experts estimate that there are 4 million cases of foodborne illness in Canada every year. 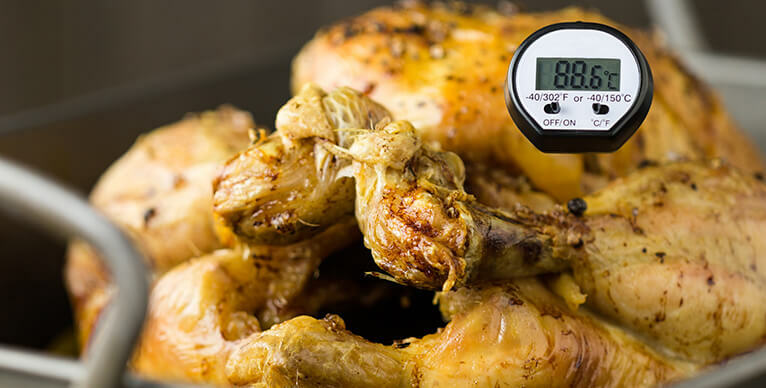 Most cases of foodborne illness can be prevented by following safe food handling practices and using a meat thermometer to check that your food is cooked to a safe internal temperature. What are the most common mistakes when it comes to food safety? Which kind of cutting board is better, plastic or wood? The choice is yours. What’s most important is to use one for raw meat, poultry and seafood and a separate one for ready-to-eat foods like vegetables. Make sure to wash cutting boards after each use and discard boards that are showing signs of wear, such as excessive cracks or crevices. How long can I leave food out of the refrigerator? Food should not be left out longer than two hours and in hot weather, no more than one hour, since bacteria grows rapidly in warmer temperatures. Is it OK to defrost foods, including meat, on the kitchen counter? Never allow foods to defrost at room temperature. Most foodborne pathogens thrive at room temperature and can put you at risk for Salmonella and other foodborne illnesses. The safest way to defrost frozen foods is in your refrigerator. I bought too much turkey breast cold cuts – can I freeze them? Simply package them in an airtight freezer container or wrap and freeze for as long as two to three months. How long can you keep sliced cold meat and still eat it? As long as the meat has been refrigerated right away and wrapped well to keep it from drying out, it can be stored for two to three days. Can you reheat meat leftovers the next day? Yes, meat leftovers may be eaten cold or reheated to 165°F or 74°C. Can you refreeze hot dogs that were thawed in the refrigerator? Hot dogs can be thawed in the refrigerator and refrozen once. So before refreezing, divide the hot dogs into single-use amounts. How long can I store poultry in the fridge? Always check for and follow the "best before" date and storage instructions provided on the package. Generally, when stored in the refrigerator (4°C or 40°F), sealed whole birds can be kept for two to three days, sealed pieces for two to three days, and sealed ground meat for one to two days. Does frozen chicken ever go bad? Generally, when stored in the freezer (-18ºC or 0°F) and well wrapped, whole birds can be kept up to 12 months, pieces for 6 months and ground meat for 3 months. Do I have to wash meat before cooking? It is not recommended as this can spread bacteria to kitchen surfaces and other foods. Where do I insert the meat thermometer to check for the temperature? Insert an oven-safe meat thermometer deep into the thickest part, taking care not to touch any bones or fat. Nitrate and nitrite are naturally occurring compounds that are everywhere in our environment including fruits and vegetables. Green leafy vegetables, beets and radishes contain the highest levels of nitrate. The nitrate in vegetables, cheese, cured meats, and even our drinking water, are naturally converted into nitrite and nitric oxide in our bodies. Maple Leaf® meats are cured using cultured celery, in which bacteria have transformed nitrate into nitrite in a very similar way. In the mouth, ‘good’ bacteria transform nitrate into nitrite, which are then used by the body for various metabolic processes. To safeguard Canadians, Health Canada requires that nitrate and nitrite be used in certain cured meats to protect against the growth of harmful spore-forming bacteria such as Clostridium botulinum. Nitrite can be added to meat products in two ways: either through sodium nitrite, which is synthetically produced, or through a natural source like cultured celery extract. Either way, they provide the same important food safety benefits. Cured meats can be part of a healthy balanced diet. They are an important, convenient source of protein, iron and minerals. vegetable-based ingredients, such as cultured celery extract. Cultured celery extract is cultured to provide nitrite through a process similar to adding bacterial culture to milk to produce yogurt. In combination with vinegar, lemon juice and sea salt, cultured celery extract is a natural preservative that plays an important role in food safety. These are premium products. We removed artificial preservatives and replaced them with natural ingredients. We only use the finest cuts of meat. 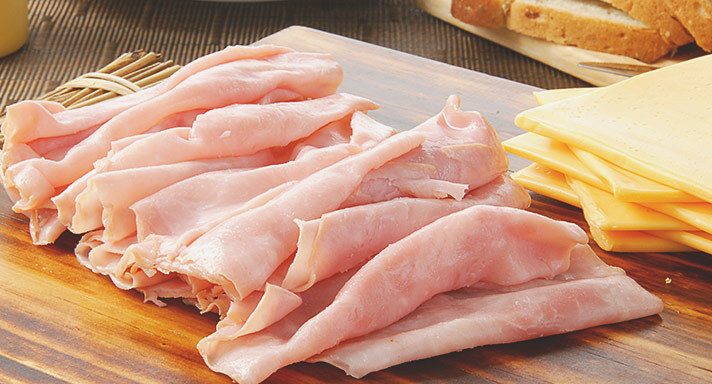 These products are among the very best tasting sliced meats in the market. How Do Our Bodies Get Nitrate, Nitrite and Nitric Oxide? Vegetables such as beets, celery, lettuce, radishes and spinach contribute about 85 per cent to 90 per cent of our dietary intake of nitrate. In our mouths, good bacteria react with nitrate to produce nitrite and provide approximately 50 per cent of the body’s nitric oxide. The highest levels of nitrite are found in colostrum, the breast milk produced immediately after birth. This is nature’s way of supplementing the production of essential nitric oxide to keep babies healthy. 1 The Nitric Oxide (NO) Solution: How to Boost the Body’s Miracle Molecule to Prevent and Reverse Chronic Disease by Nathan S. Bryan, PhD and Janet Zand, OMD with Bill Gottlieb. Published in 2010 by Neogenis. Frequently asked questions about nitrate and nitrite. Nitrate (NO2-) and nitrite (NO3-) are two molecules that create nitric oxide in the body, which is essential to a healthy metabolism and good cardiovascular health. What is the difference between nitrate and nitrite? Nitrate is converted to nitrite in our bodies through a normal metabolic process. Nitrate is converted to nitrite through healthy bacteria in our mouths and saliva. Do our bodies need nitrate and nitrite? Yes – they are important to the formation of nitric oxide, which is essential to good cardiovascular health, and they have many other health benefits. Approximately 50 percent of nitric oxide in our bodies comes from the food we eat, and the other half is actually produced by our bodies as part of our normal metabolism. Why are they added to cured meats? Nitrate and nitrite have been used as a food preservative for thousands of years. They act as an antioxidant in meat to keep fat from breaking down, causing poor flavour, and to also inhibit the ability of spoilage bacteria and pathogens, such as Clostridium botulinum, to grow. What foods contain nitrate or nitrite? Many foods, including leafy green and root vegetables as well as cured meats, contain both nitrate and nitrite. What is Health Canada’s position on nitrate and nitrite? Nitrate and nitrite are approved in Canada and around the world as a safe and essential preservative. Health Canada requires their use in certain cured meats to protect food safety. For more information on the allowable input level of nitrate and nitrite in cured meats, please refer to Health Canada’s Food and Drugs Regulations or visit the Canadian Food Inspection Agency’s website and search for the Meat Hygiene Manual of Procedures. How do you define “natural”? The Canadian Food Inspection Agency defines the appropriate use of the word "natural" for the food industry and we must adhere to their policies. Essentially it means that the product contains no artificial flavours or additives, with no significant processing or alteration of ingredients. What ingredients did you remove to claim these products are “all natural”? We removed sodium nitrite, sodium phosphate, sodium diacetate, potassium lactate and sodium erythorbate. All ingredients that go into Naturals® must be approved by the CFIA and defined as natural under their regulations. Do “natural” meat products contain nitrate? They do if they contain certain vegetable-based ingredients, such as cultured celery extract, which are sources of naturally occurring nitrate and nitrite. Cultured celery extract is cultured to produce nitrite through a process similar to adding bacterial culture to milk to produce yogurt. In combination with vinegar, lemon juice and sea salt, cultured celery extract is a natural preservative that plays an important role in food safety. What exactly is cultured celery extract? It is celery fermented with bacteria, similar to how yogurt or beer is made. It is a natural source of nitrite. Why did Maple Leaf develop this line of products? Consumers told us they wanted products made with simpler, fewer, more natural ingredients. It took us more than four years to develop these products. How is cultured celery extract different from sodium nitrite? Cultured celery extract is a natural preservative. Sodium nitrite is synthetically produced. What is the nitrite level in Maple Leaf’s natural line of products compared to conventionally cured meats? We typically have nitrite levels of 100–200 parts per million of nitrite in both our regular cured meats and in our natural line of products (except bacon, which is 10 percent lower). However, nitrite degrades, so over time, levels in both conventional and natural products are reduced to similar, very low levels. Can nitrite in cured meats lead to the formation of nitrosamines? Nitrosamines are compounds which rarely form and only under certain conditions, when nitrite and secondary amines (proteins) react. Some nitrosamines are harmless to humans while others are carcinogenic. Exposure to nitrosamine carcinogens can potentially occur through a number of sources including cosmetics, tobacco, medications, agricultural chemicals and occupational exposure. There is a very low risk of exposure to nitrosamine formation in cured meats. It is effectively inhibited through including ascorbic acid (Vitamin C) or sodium erythorbate (a chemical cousin to Vitamin C) in the ingredients. This has been proven through mandatory tracking of nitrosamine levels in cured meats by the United States Department of Agriculture for the past 30 years. There is a slightly higher risk that nitrosamines could form through cooking cured meats at high temperatures, particularly bacon. As a result, slightly higher levels of ascorbic acid or erythorbate are added to bacon, which reduces any nitrosamines to minute levels (measured in parts per billion). Is there a potential link between eating cured meats and increased risk of some forms of cancer? The gold standard for determining carcinogenicity of chemicals is a decade-long, comprehensive study conducted by the National Toxicology Program in the U.S. Based on their findings, and review by an independent scientific panel, it was concluded that there was no evidence of a link between consumption of nitrite and cancer. There have been epidemiology studies based upon diet history information that indicate a potential association between high levels of prepared meat consumption and colon cancer; however, there are many confounding factors in these types of studies, and epidemiology alone does not determine cause and effect. The Canadian Food Inspection Agency and regulatory agencies around the world view nitrite as safe, and it has an essential role in protecting food safety. Published in 2011 by Humana Press. Go to www.springer.com to purchase the entire book. Reprinted with permission of the American Meat Science Association. Reprinted with permission of DEStech Publications, Inc., from Food, Nutrition and the Nitric Oxide Pathway, edited by Nathan S. Bryan. Copyright 2010. Go to www.destechpub.com to purchase the entire book. Published in 2010 by Neogenis. Go to neogenis.com to purchase the entire book.